A great place for Thai food! Wel­come to the Thai Cor­ner Restau­rant in beau­ti­ful Sidney-by-the-sea on Van­cou­ver Island, British Colum­bia. We pre­pare Thai cui­sine, blend­ing ele­ments of cen­tral and north­east­ern (I-San) Thai tra­di­tions. 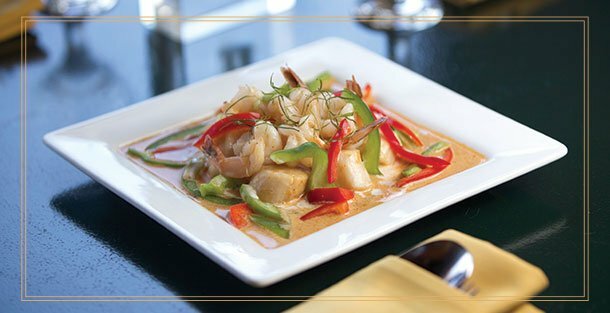 We serve a vari­ety of Thai cur­ries, spicy sal­ads and stir fried del­i­ca­cies. With over two decades of expe­ri­ence cook­ing Thai food in Thai­land, over­seas and right here in Canada our chef has care­fully devel­oped fresh menu selec­tions for both lunch and din­ner sure to suit a vari­ety of tastes. Drop in for a visit and expe­ri­ence our “Sidney-style” Thai hos­pi­tal­ity. All you can eat buf­fet lunch is served daily 11:30am to 2:00pm. Din­ner is served Mon­day to Thurs­day from 2:00pm to 8:30pm, Fri­day and Sat­ur­day 2:00pm to 9:00pm. Our din­ner menu is quite exten­sive with a vari­ety of tasty appe­tiz­ers to start off your meal. Com­plete your din­ing expe­ri­ence with some tra­di­tional Thai desserts or ice cream.